If you see a message like this, click "more info" and choose "Run anyway". One person had trouble installing CogSketch on Windows 8 – the installer aborted and gave the error message "The wizard was interrupted before CogSketch could be completely installed." Getting the latest Windows Updates fixed the problem. Early versions of Windows 8 apparently did not completely support the Windows Installer API in a backwards-compatible manner. If CogSketch crashes, it can lead to corruption in the knowledge base. The best way to fix this is to revert to the knowledge base from the original distribution. It is a good idea to back up the knowledge-base. If you enable Experimenter Mode in the preferences, you will see the FIRE menu. This has menu items for backing up and restoring the knowledge-base. You can also download the latest version of the knowledge-base from the CogSketch website. Usually if your graphics driver doesn't support CogSketch's OpenGL windows, you'll get an error message saying something to that effect. On at least one machine configuration, though, the sketching windows failed to be created but no error message was generated – when creating a new sketch or opening an existing one, CogSketch hung while displaying a message saying "Starting MMI and Ink-Processor ..." and no sketching window was created. Installing the latest graphics driver for that machine fixed the problem. While ink- and voronoi- processor crashes have become quite rare, they are still possible. The healing touch of your cursor on the icon representing the spatial processor that is crashed should restore it. Pick "Hardware and Sound"/ "Pen and Touch" (or "Pen and Input Devices"). This opens the dialog shown below. 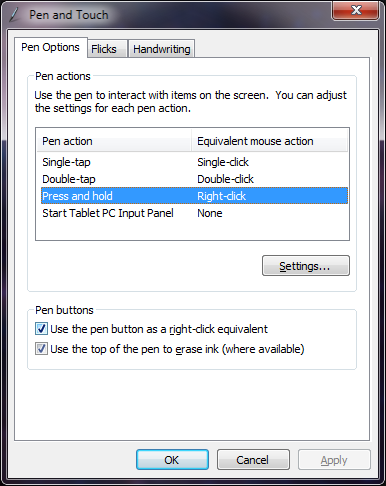 On the "Pen Options" tab, click "Press and hold", and then click the Settings button. 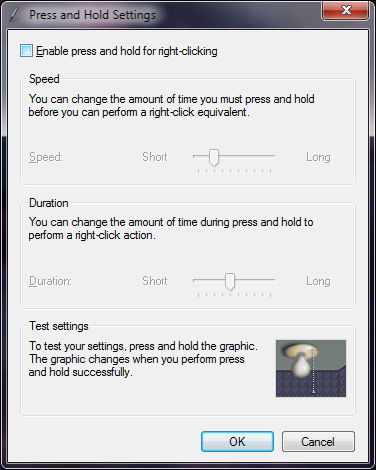 On the Settings dialog, uncheck "Enable Press and hold for right-clicking". CogSketch uses OpenGL for rendering. On some very old Tablet PCs, OpenGL hardware support only works in landscape mode, not portrait mode. If you start CogSketch in one display mode and switch to the other, it will hang on such machines. The only workaround for such machines is to close CogSketch before switching display modes. Microsoft Surface Pro Users: This summer (2013), Microsoft released a firmware update for the Surface Pro that reverts the graphics driver to an earlier one that does not support OpenGL. To fix this, you'll have to download and install the latest HD4000 graphics driver from Intel. Hopefully Microsoft will release an update that fixes this problem soon.